The Armory vs The ADAA: Who’s Got the Light Cans? Friedrich Petzel’s 21 + cans of light hanging from the Park Armory’s ceiling. Prompted by ubiquitous claims that quality of light distinguishes one art fair from another, I decided to see how The Armory measures up to the ADAA on that standard alone. 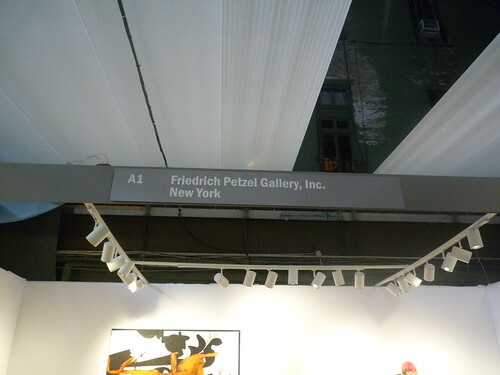 The former is the current king of the New York contemporary fairs, the latter offers prestige to any invited member of its association. If my photos are any indication, this year’s Armory looks rinky-dink by comparison. Lighting rigs at the Armory. Hey, that’s my booth! I was wondering why you took that photo. In both cases I actually just meant to shoot the name of the gallery so I could label my photos appropriately. It happened they could be used for more than one purpose.